Article on the Apartheid-like conditions which Palestinian migrant workers labour under, the obstacles which the Israeli occupation puts on their ability to organise and the ways in which they have attempted to overcome it. Also looks at how the Zionist trade union, the Histadrut, is one of the main exploiters of Palestinian labour. FOR OVER A DECADE, West Bank and Gazan labourers in Israel were all but ignored. For sections of the Palestinian nationalist movement, they were an embarassing symbol of the failure of the policy of sumud (steadfastness) to prevent the occupation from effecting deep structural changes in the society and economy of the occupied territories. For the international media, migrant labour was undramatic when compared to more newsworthy guerrilla operations or demonstrations. Israeli society, albeit with exceptions, preferred not to notice its Arab labour and, when the 'Jewish' state's embarassing dependence on non-Jewish labour was noticed, particularly on Muslim feastdays, the conviction that the Arabs were more dependent on Israel than vice versa was a comforting reaffirmation of ethnic superiority. The 1980s have seen the development of interest in the migrant workers. The nationalist movement has embarked on attempts to recruit them into unions; the international media has found numerous opportunities to draw comparison with South African migrant labour, together with a plethora of 'human interest' stories; Israeli sociologists have discovered a topic worthy of newspaper articles and treatises; and the Histadrut has been under increasing international pressure to justify its attitude towards Palestinian workers. The Palestinian intifada (uprising) which began on 9 December 1987 brought stayaways by migrant workers and, sure enough, sectors of the Israeli economy ground to a halt. These events have a great significance which the Palestinian nationalist movement and Israeli employers and state will seek to evaluate. The Palestinians have learnt to use a new weapon and Zionism has discovered a weakness forged by its own hand. With this in mind, it is important to understand the conditions under which migrant labourers work because it is only by appreciating the extent of their exploitation that their weaknesses and their strength can be assessed. This article attempts to provide the material for such an understanding. As a final introductory note, readers' attention should be drawn to the excellent article by Emanuel Farjoun in Khamsin 7 (Palestinian Workers in Israel - a reserve army of labour). The following article is more specific in that it deals only with the phenomenon of migrant labour. Nevertheless, it can, in part, be viewed as an update on Farjoun's piece which should be read by anyone with an interest in the Arab workforce in the Israeli economy. Who are the hewers of wood? Even on the basis of the numbers given for registered migrant labourers, the scale ofthe employment of West Bankers and Gazans is evident. In 1984, 93.7 thousand residents of the occupied territories (excluding East Jerusalem) were employed in these areas as agricultural workers or as skilled, semi-skilled or unskilled workers in industry, mining, building, transport etc., as against 76.7 thousand employed in such work in Israel.8 If agriculture, which accounts for 37 thousand of those employed in the occupied territories, is removed, it is clear that more workers resident in the occupied territories work for Israeli industry, mining, building, transport etc. firms than work for such Palestinian concerns (63.3 thousand as compared to 56.7 thousand). The submissions go on to assert that some 20% of registered migrant workers are given permission to stay overnight in Israel. Such claims have been accepted by some observers (Semyonov and Lewin-Epstein, for example). However, a typical week's return travel from Gaza to Tel Aviv to seek work costs the equivalent of one day's wages and may take four hours per day.25 Matters are not necessarily better when employers provide transport. In 1985, labourers from Bethlehem working in a bakery in Jerusalem, 20 minutes' drive away, complained they had to leave home at lam to start their shift at 3am. One ofthem said: 'We arrive at the bakery before the doors are open and so we are forced to stand in the street without any protection from the cold. '26 The cost in time and money forces many workers to stay overnight illegally inside the Green Line. Some do this with the collusion of employers and some even take on nightguard jobs to supplement their daytime earnings. In 1985, the Knesset Interior Committee was told that 50,000 West Bankers and Gazans slept overnight in Tel Aviv alone.27 The conditions under which such workers live will be dealt with later. In Qalqilia in the north of the West Bank, Gazan workers live in hostels or in the grounds of the mosque in order to be able to reach their places of work. The offices were established in the occupied territories as a means of regulating the flow of Palestinian workers, a flow which had already begun spontaneously. Such regulation was based around three considerations: control over the number of migrant workers; control over their movement inside the Green Line; and control over their wages. Jewish employers refuse to employ anyone if he is registered with the lishka [work office] and so they do not have to observe any of our union or legal rights. And when employers learn that one of the workers wants to be registered, they refuse and say to him, "There is no place for you here. Leave the firm. All the Arab workers of Rishon Letzion work through middle-men who set the pay rates and distribute wages to 'their' workers on the various sites. As they are responsible to the municipality for the work of the labourers, no one really knows exactly how many Arab workers there are. The workers who were interviewed put the number at around 150 with three middlemen. There is no job security and wages are determined when a man is hired. The pay level varies from middleman to middleman and on the ability of the workers to levy the occasional rise. Workers 'Issa Jibran, Yasser Souayfa, and Khalid Tamizi stated that the average wage varies between 16 and 20 shekels per day but that it depends where the workers come from. Those from Ramallah get 16 shekels, those from Gaza 20 shekels, and those from Hebron 18 shekels. This discrepancy is due to the plurity of middlemen. . .
. . . More than twenty of the Gazan workers have not been paid for a month and a half. The reason? Well, the excuse given by the middleman is that his boss has not yet finished his [annual] military service. The workers never cease to worry about this. . .
No major changes in the level of irregular employment of workers from the occupied territories in Israel were noted in 1985. The Israeli authorities consider this stability - a view shared by the Histadrut - to be proof that the difficult economic situation in Israel has not, as might have been feared, forced employers to turn away from official recruitment channels. . .
Migrant workers are employed in enterprises that range in size from one person outfits to large kibbutzim and moshavim, Histadrut-owned factories and municipalities (a handful of migrants work for Palestinian municipalities inside the Green Line and some of them have complained of discrimination). Larger, non-agricultural enterprises are more likely to use registered workers since they have more complex accounting systems and are less subject to seasonal fluctuations in labour demand, but they are clearly no less exploitative of their workers. This is apparent from an analysis of some of the techniques of super-exploitation by employer and state alike. West Bank workers are maintained as daily lie casual] workers even when they have worked somewhere for ten years. This means sacking is easy and family and seniority increments are not paid. This being the case for registered workers, Taggart's flndings in late 1984 are hardly surprising: unregistered women fruit pickers were earning the equivalent of £1.50 per day, child workers earned £3.50 per day, and adult male labourers got £3.75 per day.59 A 1987 newspaper report noted that workers aged between nine and fourteen years from the village of Husan, employed at Mafubitar settlement, were being paid five New Shekels for an eleven hour day.60 Palestinian trade unionists say that it is by no means uncommon for an employer to simply refuse to pay a worker picked up from one of the slave markets, knowing he can do nothing about it. In other words, migrant workers pay contributions for these beneflts because they work in Israel but are themselves denied the beneflts because they do not live inside the Green Line and could not do so even if they wished. The dangers of injury during working hours are compounded by the frequent attacks on Palestinian workers by their Jewish counterparts and the 'security' forces. Attacks are so commonplace that they barely warrant a mention in either the Hebrew or the Arabic press. At the lower end of the scale is simple harassment but injuries are often serious and deaths are not unknown. On the ground, though, local Histadrut officials and workers' committees at best demonstrate a lack of enthusiasm for the task, and a tendency to deny or to shrug off their responsibilities. Nevertheless, the problem in the labour movement begins at the top. An example of the Histadrut fmally agreeing that Arab workers should be treated on the same basis as Jewish workers has been cited. However, this contrasts with the day-to-day experience of migrant workers which reflects the discriminatory nature of the Zionist Labour Federation. MIGRANT LABOURERS face gross economic exploitation maintained by structural discrimination and violence, and by enforced separation from home and family. This exploitation is underpinned by their oppression as part of the Palestinian nation. Any expression of Palestinian identity is deemed as troublemaking and is repudiated as unwarranted. Their identity as Palestinian Arabs, according to the ideology of Zionism, enables the treatment they receive; any organisation along such lines is strictly prohibited, for it threatens not only the super profits of their employers but also the fiction around which the Zionist entity is built. Capital seeks to exploit the proletariat as a class whilst publicly denying the existence of class relations and propounding concepts of individualism and social mobility. Post-1967 Zionism, the Jewish labour movement being largely co-opted and capitalist relations of production thus ensured, has also sought to establish a form of super exploitation by recruiting a Palestinian migrant labour force which it has tried to atomise by repressing all forms of self-expression and denying all national rights. However, double exploitation brings with it double jeopardy, for the migrant worker has national grievances as well as class grievances. An important manifestation of the uprising which exploded in December 1987 has been the militancy ofthe migrant workers ofthe West Bank and Gaza Strip. In 1984, the Progressive Workers Bloc claimed 25 committees in workplaces inside the Green Line and was attempting to set up committees of migrant workers in villages and refugee camps. Since 1979, the Workers Unity Bloc (sympathetic to the DFLP) has also been involved in such organisation. Union membership offers migrant workers access to information, such as the pamphlet explaining the wage, safety and benefit rights, published by a union in Qalqilia in 1987.91 The union also offers legal advice, access to a union clinic and limited financial support in times of hardship. Fundamentally, unionisation has often been a way of surviving the rigours of migrant work, more like a Friendly Society than a powerful industrial weapon. This said, despite the recent entry of most migrant workers into wage labour, contemporary Palestinian trade unionism has deep and militant roots. These come not only from the communist tradition but also from the foundation of the movement in the 1920s and from the six month General Strike of the 1936-39 uprising. Despite immense problems, migrant workers have taken industrial action over workplace grievances on a number of occasions. Such action has ranged from small-scale sabotage and job-hopping to strike action. Al-Tali'a, 26 June 1986, reported that workers in a factory at Tel Bayout, near Jerusalem, organised a committee and went on strike to fight for higher wages and to oppose the exploitative practices of the employer and the middlemen. The same article reported that workers at the Matsadeh Restaurant in Arad had formed a committee to oppose the sacking of one of their number whose offence was to be ill for one day. The man in the petrol station was behaving very oddly. He was pointing the petrol pipe at my car window, and started to clean it with a strong stream of gasoline. He looked embarrassed. "Ahmed did not turn up today. It's his feast day", he told me with a trembling voice. "I am the owner of the petrol station. This is the first time I have to do this.'" The harvest is not yet at its height, which will be at the end of January. Still, there can be no doubt that the absence of the Arab workers messes up the job in hand. Today I heard that Tnuva Export in southern Israel did not pack anything at all, as the workers had not picked any fruit. And how much does the absence of migrant workers actually cost the Israeli economy? In January 1988, the marketing manager of the agricultural marketing board, AGREXCO, stated that $500,000 had been lost in three weeks and that customers such as Marks and Spencer, Sainsbury, and Safeway were 'very upset'.99 A few days later, The Independent quoted an Israeli army report as estimating the cost of work stoppages since the beginning of the uprising at $50 million in lost sales and production. Over 500 permits had been issued to workers from southern Europe to compensate for the absence of Arab labour. Jerusalem building site managers were failing to attract workers, despite doubling wage levels.100 The impact on tourism will not be known for months. THERE IS LITTLE POINT in pretending that the Palestinian working class has suddenly arisen from its slumber or that the events of late 1987 have suddenly transformed it from a class in itself into a class for itself. Since 1967, Palestinian migrant workers have understood their double exploitation, resenting it and wanting to be in a position to fight it. The uprising has allowed them to do so because it has offered them something which they have never had before, strategic depth. The uprising has embraced the entire community of the occupied territories (and Palestinians inside the Green Line). Its fury and its all-embracing nature have left little opportunity for wavering. With schoolchildren seizing the streets and old people demonstrating outside mosques, it has been socially impossible for workers to cross the Green Line, whatever the imperatives of feeding their families. The imposition of curfews by the Israeli army and the burning of buses by the shebab has reinforced this impossibility and that is precisely what has been needed for the last two decades. Working in enemy territory, migrants are terribly exposed to the wrath of employers and to the fear of losing work and not being able to provide for the family. No amount of distaste at working for the Zionist economy and no amount of private or rhetorical anger at Zionist barbarity in Lebanon has been powerful enough to persuade tens of thousands of workers to put the precarious health of their families on the line. The uprising, however, has provided a guarantee that there is a fate worse than unemployment - isolation from a community paying for its discontent with blood. Strike action is often not only determined at the national level but workers spontaneously refuse to accept jobs left vacant by compatriots from villages on which travel bans have been imposed.101 This is not to downgrade the day-to-day fortitude of the migrant workers or to dispute their affiliation to the aspirations of the Palestinian people as a whole; rather it is to face up to the reality that neither patriotic words nor bombs on buses can achieve what the unanimous support of a self-organised community can. As to the future, both the Zionist establishment and the Palestinian working class will learn from the uprising, but one side of weakness it had not appreciated and the other side of strength it had never before trusted. 1. UNCT AD, Selected Statistical Tables on the Economy of the Occupied Palestinian Territories (West Bank and Gaza Strip), Geneva, July 1986, p16. 3. Al-Bayader al-Siyassi (English language supplement) 20/11/87. 4. Moshe Semyonov and Noah Lewin-Epstein, Hewers of Wood and Drawers of Water: Noncitizen Arabs in the Israeli Labor Market, ILR Press, Cornell University, USA, 1987, pp11-13. 6. Paul Harper, Labouring Under Oppression: Poles and Palestinians, CAABU, London, p4. 8. Semyonovand Lewin-Epstein op cit. pl0. 9. Antoine Mansour, Palestine: une économie de résistance en Cisjordanie et à Gaza, Paris, 1983, quoted in The Economic Destruction of the Occupied Territories, PLO, London, 1986. 10. Al-Fajr (English), 22/2/85, Jerusalem. 11. Najouah Makhoul, 'Modifications dans la structure de l'emploi des arabes en Israel,' Perspectives Judéo-Arabes, October-December 1985, Paris. 12. Al-Bayader al-Siyassi, op cit. 13. UNCTAD, op cit. p19. 14. Semyonov and Lewin-Epstein, op cit, pp.9-11. 15. Al-Fajr (English), 22/2/85, op cit. 16. Sarah Graham-Brown, Education, Repression, Liberation: Palestinians, WUS (UK), London, 1984, p68. 17. 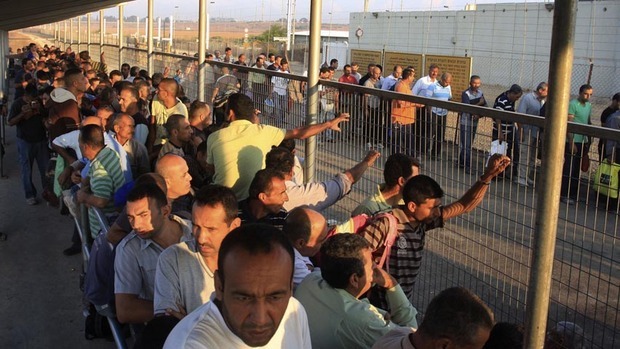 UNRWA, 'Economic squeeze hits refugees in West Bank, Gaza', Palestine Refugees Today, no. 116,1987. 20. Tanmiya, August 1986, Welfare Association, Geneva. 22. Al-Bayader al-Siyassi, op cit. 23. al-Awdah Weekly, Where to go this summer, 16/6/85, Jerusalem. 24. ILO 1987 op cit. Annex 3, p60. 25. Middle East International, 'Letter from Gaza', 27/6/87, London. 27. Jewish Chronicle, 12/7/85, London. 28. Simon Taggart, Workers in Struggle: Palestinian trade unions in the occupied West Bank, Editpride, 1985, p57. 30. Semyonov and Lewin-Epstein, op cit, p13. 31. Jerusalem Post, 3/10/84, Jerusalem. 33. Semyonov and Lewin-Epstein, op cit, p12. 35. Taggart, op cit., p65. 36. Michael Shalev, 'Winking an Eye at Cheap Arab Labour', Jerusalem Post International Edition, week ending 18/1/86. 37. Semyonov and Lewin-Epstein, op cit., p12. 39. Middle East International, op cit. 40. International Labour Organisation (ILO), Report to the Director: Appendix III, Report on the Situation of Workers of the Occupied Arab Territories, 1986, Annex 3, p65. 42. ILO 1987, op cit., para 24. 44. Semyonov and Lewin-Epstein, op cit., pp22-23 (table). 48. Al-Fajr (English), 22/2/85, See also ILO 1987, op cit., para. 21. 49. Taggart, op cit., p66. 50. ILO 1987, op cit., para. 37. 51. Ibid, Annex 3, p59. 52. Taggart, op cit., p60. 53. ILO 1987, op cit., Annex 2, p43. 54. Al-Bayader al-Siyassi, op cit. 57. Taggart, op cit., p60. 58. Semyonov and Lewin-Epstein, op cit., p88. 59. Taggart, op cit., p15. 61. Taggart, op cit., p60. 63. ILO 1987, op cit., para. 38. 67. Morning Star, London, 7/11/84. 74. International Labour Reports, no. 24, Barnsley (Britain), November-December 1987. 77. Al-Fajr (English), 22/2/85. See also ILO 1987, op cit., para. 21. 80. ILO 1987, op cit., para. 36. 83. International Labour Reports, op cit. 85. Semyonov and Lewin-Epstein, op cit., p104. 86. ILO 1987, op cit., para. 49. 87. International Labour Reports, op cit. 88. Histadrut Executive Committee reply to letter from British trade unions. 90. Taggart, op cit, p58. 91. One-off publication of Qalqilia Union of Municipal and Public Institute workers on subject of migrant workers' rights, 1987. 93. Al-Tali'a, 21/11/85 and Kol Ha'ir, 8/11/85 (translated in Israeli Mirror, London). 94. Taggart, op cit., p39. 95. Ha'aretz, 2/8/81, quoted in Harper, op cit., pp4-5. 96. Ma'ariv, 4/8/81, quoted in Harper, op cit., pp5-6. 97. Ha'aretz, 18/12/87, translated in Israeli Mirror, op cit., 24/12/87. 98. Yediot Ahronot, 15/1/88, translated in Israeli Mirror, op cit., 16/1/88. 99. Financial Times, London, 28/1/88. 100. The Independent, London, 30/1/88. 101. Intifadah wa al-Ard, one-off publication of Dar al-Sharara, West Jerusalem, March 1988.